Time Zone- Time is very important when on shore from your cruise, so you want to make sure you’re informed on ship time and local time. St. Thomas is located in the Atlantic Standard time zone, and we do not observe daylight savings time. So what does that mean for cruisers? St. Thomas is 1 hour ahead of Eastern, 2 hours ahead of Central, except during daylight savings. Regardless of the time zones, it’s vitally important to note that ship time is not local time. Set your watch to the ship time before entering St. Thomas to ensure that you are back on board in time. Consider this when booking St Thomas shore excursions as well. Tour operators go by local time, so if your tour departs at 9 am, you’ll want to calculate what time that would be in ship time to ensure you do not miss your tour- it has happened to me, and it puts a damper on your day in shore! KNOW- Ship Time is NOT local time. St. Thomas is in the Atlantic Standard Time Zone. Set your watch for ship time and translate local time when booking excursions to ensure you do not miss your tour or your departing ship. Currency & Gratuity- Having to call your bank for charging privileges or visit an ATM wastes precious minutes during your shore day, so you’ll want to plan ahead when it comes to making purchases in St. Thomas. The official currency in the USVI is solely the U.S. dollar. Note that ship cards cannot be used for charging anywhere on the island. While many places on island accept major credit cards, there are many venues which will only accept cash (taxis, ferry terminals, customs docks, and some vendors and restaurants). Plan to carry cash accordingly, and remember to inform your credit card provider that you will be in the Caribbean. The U.S. Virgin Islands are duty free which means no tax is added on any goods or food, so take advantage and score amazing deals on everything from liquor to jewelry while you’re in St. Thomas! Resorts and excursions in St. Thomas may have resort tax and fees added on, so be careful to note these fees if visiting a resort for the day or when arranging shore excursions. Customary gratuity rates when dining in the USVI are the same as the States, 15-20% on food tabs. Review your bill carefully as some popular restaurants will automatically charge gratuity. KNOW- In St. Thomas, The U.S. dollar is the only currency accepted. Credit cards are not accepted at all venues, so plan to carry cash. Remember that your ship card is not accepted as currency anywhere in St. Thomas. Tax is not added to any retail or dining purchases in St. Thomas, but fees or auto-grat may be charged from resorts, tour operators, and restaurants. Cruise Ports- There are two cruise ports in St. Thomas: Havensight Mall and Crown Bay Marina. 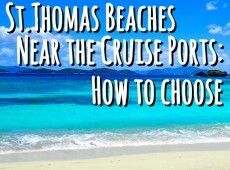 You can check the St. Thomas cruise ship schedule HERE to find out which dock your cruise will come in on. Be wary of third party sites that provide cruise ship schedules as they may not be accurate; you should always check the dock’s schedule. Havensight Mall is the primary cruise dock and provides a warm welcome as you disembark your ship into one of the largest shopping areas in St. Thomas featuring souvenirs, jewelry, electronics, and more. Our Havensight Restaurant Guide provides everything you need to know for enjoying a great meal in the area. From Havensight, cruisers can walk to nearby Yacht Haven Grande for duty free shopping on luxury brands and from there enjoy the picturesque waterfront stroll to Downtown Charlotte Amalie. Charlotte Amalie contains a wealth of jewelry store to score mega deals on gold, diamonds, and rare gemstones. Downtown Charlotte Amalie is also rich with historical sights for great photo spots and learning about the culture of St. Thomas. When it comes to restaurants, our Downtown Charlotte Amalie Restaurant Guide will give you local insight to your cuisine options for dining the local way in Downtown. Crown Bay Marina is our newest cruise port, reserved for larger ships, and has many shops for you to visit right off the ship. The Crown Bay Marina area contains a few dining spots including Tickle’s Dockside Pub where you can purchase tickets to the Water Island ferry for a visit to another of the USVI during your day in St. Thomas. From each of the cruise ports, transportation is available for shore excursions or visiting other areas of the island. KNOW- Havensight Mall and Crown Bay Marina are the two cruise ports in St. Thomas. Both feature shopping and dining. Downtown Charlotte Amalie is within walking distance of Havensight Mall, and transportation services to shore excursions and other areas of the island are available at both ports. Transportation- Whether pickup is included in your St. Thomas shore excursions or you just want an island tour, you’ll want to have a game plan for transportation while you’re in port. St. Thomas taxi service is available from the cruise ports to shore excursions and other areas of the island. This transportation is a shared transportation so you don't really get a private service like you do in most cities. Average taxi fare can range to around $15 per person depending on your destination, but prices are subject to change. Be careful to use St. Thomas taxis with a taxi service light and USVI taxi license plate; these are usually large vans or open safari buses. Alternately, you can book a private St Thomas taxi to pick you up directly from the port and get you to your destination without the hassle of sharing a taxi and making multiple stops making it easier for couples, families, and groups! Accepting rides from non-licensed taxi drivers, or “gypsy taxis”, is not regulated and at your own risk. Car rental services are also available in St. Thomas and should be arranged well in advance to ensure availability. I do not recommend renting a car for just one day in St. Thomas because the island is small, and renting a car will take extra time and likely not save you any money. If you opt to rent a car, note that we drive American vehicles on the LEFT side of the road. Be sure to ask the rental company to provide you with a map of the island as GPS services do not typically work on St. Thomas because we lack a standard address system. Public transportation services are available in St. Thomas through the bus routes. The fares are $1 per person, but routes are limited and do not pick up at cruise ports. This form of transportation is not recommended as you will likely have to taxi to or from a pickup location. 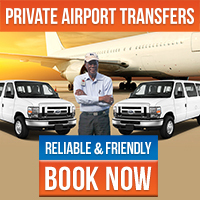 KNOW- Private taxi service needs to be pre-arranged and can pick up from the cruise ports and is the best option for getting around the island. This will allow you to skip the waiting for a taxi to fill up and make multiple stops before you can enjoy the island your way. Car rental services are available on island but should be prearranged as well. If you rent a car, remember that we drive on the left and keep a map of the island handy. Cell Phone Service- It’s important to have a communication plan for each shore day on your cruise to make sure everyone sticks together and doesn’t miss any excursions or the ship. Each cell phone provider has their own policy for service in the U.S. Virgin Islands, and you should always verify your plan with your provider before leaving the continental U.S as you do not want to be surprised with overages. Sprint and AT&T are stationed on the island and are treated the same as your domestic service. T-Mobile does not implement roaming charges for calls from the USVI. Verizon charges roaming fees for calls from the USVI but does not for text messages. With any of these providers, be careful when visiting St. John as parts of the island will pick up towers stationed in the British Virgin Islands, resulting in international charges. If your provider charges roaming fees, a smartphone can be rented in St. Thomas from Choice Wireless for $5 a day if you want to stay in communication with your group while in port. Many resorts, restaurants, and stores offer free wifi. Look into wifi calling and messaging services before your visit to St. Thomas to take advantage of this free alternative. KNOW- Verify your cell phone provider’s policy before your visit to St. Thomas to avoid roaming fees. A smartphone can be rented in St. Thomas for $5/day as an alternative. Many places on island offer free wifi for you to take advantage of. Island Wear & Packing Tips- Island casual is the norm in St. Thomas. While a swimsuit and cover is appropriate for perusing the ship, it would not be appropriate for walking downtown or eating in a restaurant that isn’t beachside. The basic rule is have real clothes on when not at the beach. Unless you are going for a run or a walking tour, sandals and flip-flops are the ideal island footwear. Sunscreen is usually cheaper in the states, so it would be wise to pack and bring with you off the ship. Consider packing or purchasing insect repellant as the island is prone to mosquitoes and sandflies. Consider bringing snorkel gear if you have it to avoid rental equipment. And of course, don’t forget your camera! KNOW- Island casual and sandals are always appropriate. Swimsuits and covers are only appropriate for the beach. Consider carrying sunscreen and insect repellent with you off the ship. Sightseeing- Island tours pick up right from Crown Bay Marina and Havensight Mall cruise ports and are a must for experiencing top St. Thomas attractions. Hit the highlights of island views and photo ops on a St. Thomas Sightseeing Tour or a 4.5 Hour St. Thomas Private Tour with an itinerary of your choice. Check out our Local Guide to Exploring St. Thomas for all the ways to see the top sites in St. Thomas. Sailing & Boating- Even with a few hours to spend, you can enjoy sailing the Caribbean sea from St. Thomas. With pick up service in the Red Hook area, it’s easy to add some adventure to your St. Thomas exploration on a sail or boating charter for a different view of the island, one from the beautiful Caribbean Sea. That is why you’re here after all! Visit our sister island of St. John and passport ready cruisers can experience the British Virgin Islands or a bit of both on a Full Day St Thomas Powerboat Charter. Discover the many ways to enjoy the Caribbean Sea and surrounding islands with our Local Guide to Sailing and Boating Excursions. Ecotours- Explore the hidden beauty of St. Thomas on an ecotour. Ecotours allow you to discover St. Thomas gems that can only be experienced on an ecotour such as the St. Thomas mangrove lagoon on a Mangrove Lagoon and Cas Cay Kayak, Hike, and Snorkel Ecotour. 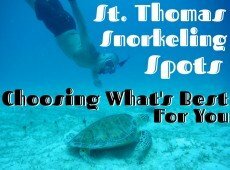 These tours venture to marine sanctuaries for a unique encounter with nature and give you the opportunity to snorkel in St Thomas. See all your ecotour options with our Local Guide to Ecotours. Shopping- Experience premier shopping destinations and make the most of duty free jewelry and luxury brands on a 4.5 Custom Itinerary Tour with a professional guide at your service. St. Thomas offers incredible shopping deals and selection on jewelry, perfume, liquor and tobacco, electronics, and more. 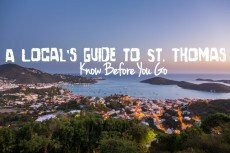 Discover the many St. Thomas shopping options and information on duty free allowances in our Local Guide to St. Thomas Shopping. KNOW- Regardless of when you are visiting St. Thomas, book excursions early, check for requirements, and avoid service fees. Remember to note the local time versus cruise ship time when booking excursions. Now that you’ve got all the “need to know”s, it’s time to start planning your unforgettable day in St. Thomas! Whether you spend it on the water, walking through history, or lounging at the beach, I know your day in St. Thomas will be the best one on your cruise! Be sure to check out our St. Thomas Shore Excursions page for the best St. Thomas shore excursions and tours! If you have any questions about cruising to St. Thomas or any inquiries about the island, call or e-mail us for authentic local insight! 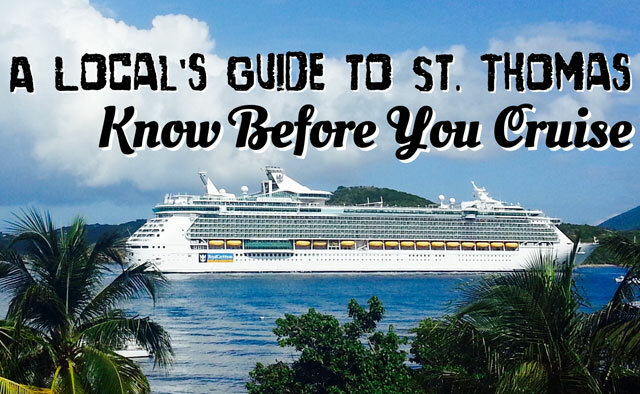 Info on St. Thomas shore excursions, taxis, packing tips, and more in our guide to everything you need to know before your cruise to St. Thomas.